A couple of weeks ago, I decided I could no longer live with our basement. We had it finished eight years ago when the boys were small, and our big dream was to get the train table out of our family room. At the time, we had no practical idea about what the space would be used for other than glorified, out-of-sight toy storage and therefore we had the contractor paint the whole space a muted and incredibly boring white, reasoning that white would keep the area bright. Over time and with much abuse by boys, the white walls became foul. For years, I’ve avoided the basement altogether, only occasionally going down there to pick up trash, throw out broken toys, and vacuum up dead spiders. That was all I could handle. Then I decided it was time to face my fears. The boys are growing up. The train table is gone. It was time for the basement to be a livable space for all of us. I needed to paint. We had to begin by cleaning the pit. I dragged the boys downstairs with me and my black, yard-size, plastic trash bags. We got to work. It was bad. Now, I’ve never wanted to be the Clean Police. I prefer to pick other battles with my sons. And I believe a boy should have someplace that isn’t subject to relentless, maternal scrutiny. (Besides, like a drill sergeant who loves surprise inspections, I prefer scrutiny on random occasions when it is unexpected.) As we continued around the room, though, I did voice my concern about their slovenliness. They reminded me that they do pick up when I ask them. I suggested that perhaps they can be more proactive about taking responsibility for the space when I don’t ask. Shockingly radical idea, I know. I requested help moving the futon away from the wall. It had been in a bed position since Luke’s sleepover birthday party at the end of May. No. I had not gone down there since the party. I left the clean up to them. They’re old enough to handle that, right? Then summer hit and life got chaotic. We were training for the Inca Trail, and the state of our hideous basement was nowhere in the vicinity of my mind. Don’t judge. As we pulled the futon bed away from the wall, I saw something stuck there. I took one step closer to investigate and realized it was half of a chocolate chip cookie. A chocolate chip cookie. Stuck to the wall. For how long, I was not sure. Oddly enough, my first thought was not, “I am the world’s worst housekeeper.” Instead it was, “How is it sticking there?” I was concerned with the physics of the situation. I actually wondered if it had frosting or something that had adhered it to the wall. My next thought was that it was reasonably disgusting that a cookie stuck to the wall for who knows how long had no mold on it whatsoever. My children had ingested those. I shuddered at what a horrible person I am for feeding that “food” to my offspring. Certainly that should qualify as child abuse. As I stood there with my mouth agape, staring incredulously at that stupid cookie, the boys started doing the math. “When did we have cookies down here?” Luke asked. Now I started doing the math. Luke’s 11th birthday party was on May 23rd. Oh holy hell. “We didn’t know it was there,” came the rejoinder. They declined. Later on, though, curiously enough, both kids asked if we could get cookies for dessert. 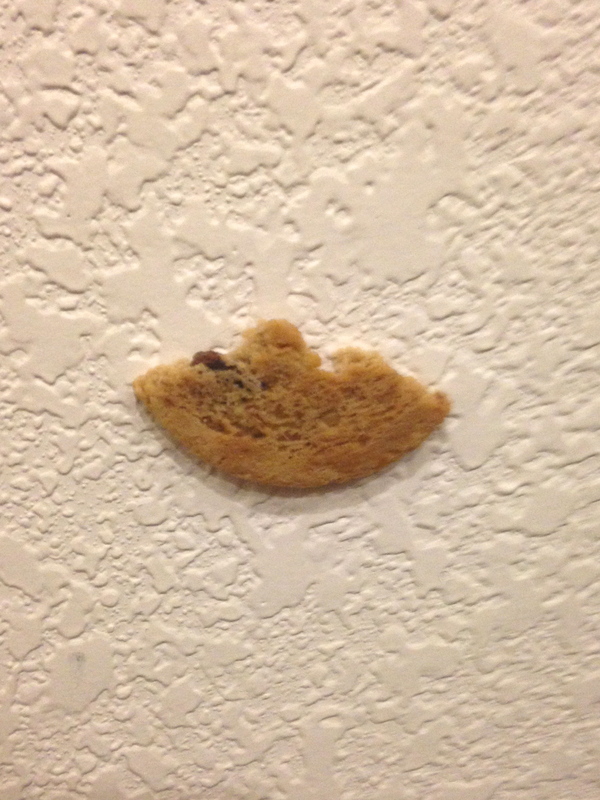 Sometimes I think back to the days before I had kids, days when I never would have found a half of a cookie stuck to my wall. I think about those days, when my house was always clean and there were no random, inexplicable scuff marks high on the walls and no Legos in my vacuum canister. There were days when I was not afraid to enter any room in my house for fear of what terror might lurk pressed up against the wall behind a piece of furniture. Once upon a time, my house looked good enough for company…all the time. Then I had boys, and my house went to the dogs. Funny thing is it has never felt more like home than it does now. If you come over and find something stuck to the walls, try not to notice it. We’re busy living here. I really enjoyed this post! I’m off out to buy some cookies haha. Thanks for the nice comment. Cookies are never a bad response to anything.